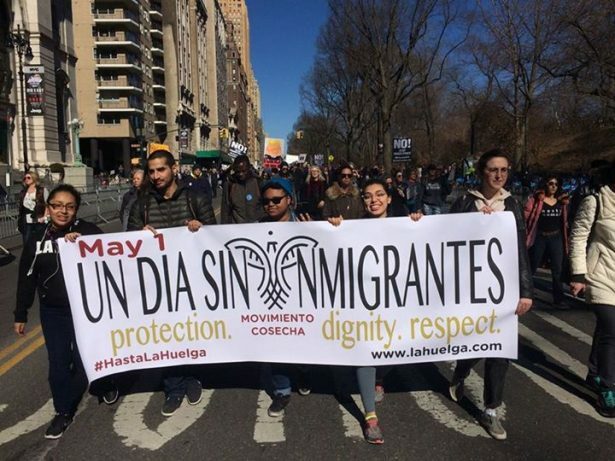 The new national immigrant rights coalition Cosecha is planning a strike for May 1 that is set to be the largest action on immigration in more than a decade. When 26-year-old Catalina Adorno hit the road on March 28, she knew it would be at least six weeks before she’d sleep again in her own bed. Since that day, Adorno, a Mexican-born New Jersey resident with a strong voice and bright laugh, has criss-crossed from Pennsylvania to Maine as part of a regional support team for Movimento Cosecha, a national immigrant rights coalition. Her stops have included major cities and small towns, as she and her three teammates work to mobilize Cosecha’s vast network of “local circles” ahead of a massive day of coordinated action slated for May 1. It’s a lofty goal for an organization that formed less than two years ago, but Cosecha has a strong track record already. 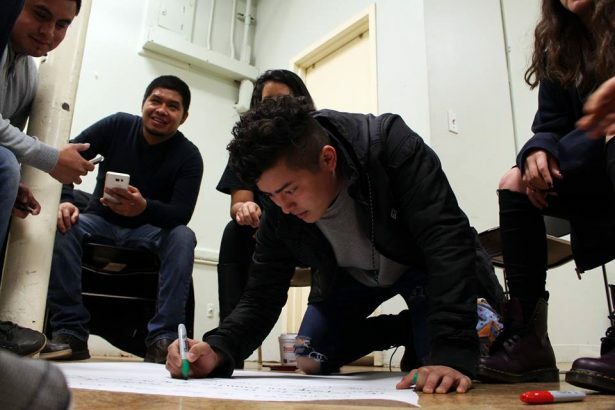 Drawing inspiration from farmworkers and their leaders — Dolores Huerta, Larry Itliong and Cesar Chavez — as well as “the thousands of African-Americans who stood up to the racist Jim Crow system,” Cosecha is an energetic movement that has grown quickly. 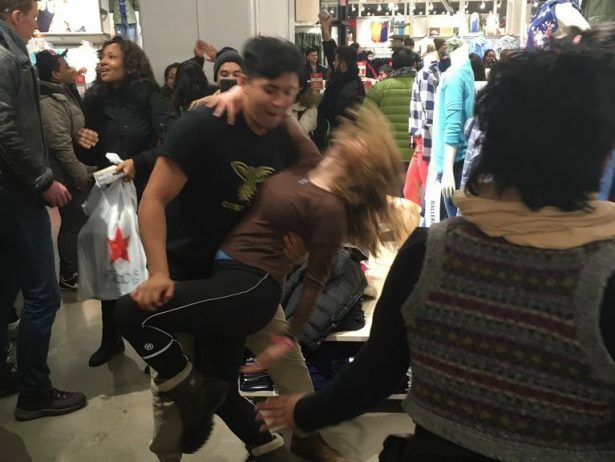 Its ranks include a national team and hundreds of part-time volunteers across the country, which enabled Cosecha to play major role in several waves of direct action, including scores of campus walkouts and multiple protests outside Trump Towers. Yet as Adorno criss-crosses the country as part of Cosecha’s support team for local activists, she has discovered a network of grassroots organizers who are channeling their own fears into action. When we spoke on the phone, she had just finished an hours-long training session with a “local circle” of workers and immigrants who are preparing to strike on May 1. The Phoenixville group is one of about 80 such Cosecha-aligned circles across the country, and it is with these groups that the real gravity of the movement rests. United by the goals of winning “permanent protection, dignity and respect” for the immigrant community, each circle is able to tailor its strategy to its own local concerns, said Adorno, while the 27-member national team plays the role of coordinator. Many of these recent actions have come in response to Trump’s aggressive targeting of the immigrant community, but it would be a mistake to view these events solely as a reaction to the new administration. The immigrant community has been threatened by deportation and criminalization for years, under both Republican and Democratic administrations. The choice of May 1 as a strike date is also a call-back to the movement’s history and the first “Day Without an Immigrant,” which took place on May 1, 2006. This first strike came at a similar time of national foment and anti-immigrant legislation. The particular trigger in 2006 was the so-called “Sensenbrenner bill” proposed in the U.S. Senate, which would mandate harsh crackdowns on the undocumented community and criminalize employers and private citizens deemed to be providing “aid” to “illegal immigrants.” Incensed, immigrants and allies demonstrated in over 140 cities, with a half-million marching in Los Angeles and 100,000 in Chicago. What made the difference, Engler contends, was the overreach of the Sensenbrenner bill. 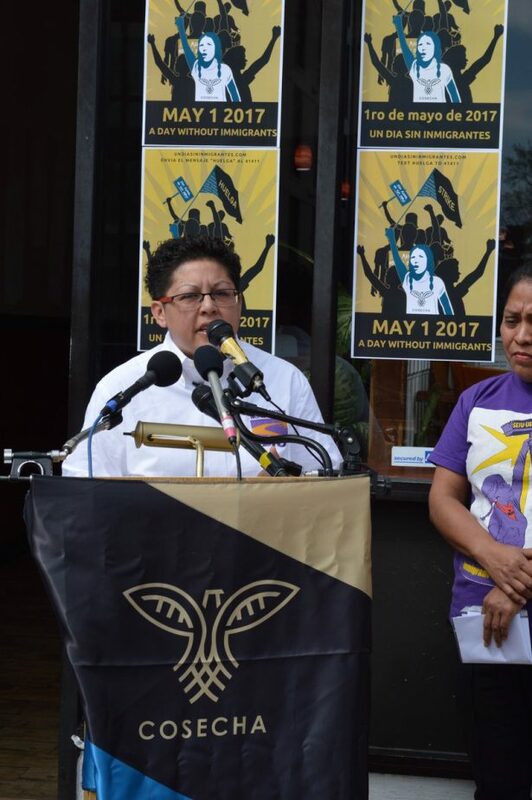 After months of deportations and raids, the bill’s draconian measures served as a “trigger event,” pushing an already-agitated community from terror to determination. “There was a change in the air,” Engler recalled. “It was the beginning of a permanent shift.” Soon, a galvanized front, led by Latino organizers, began mobilizing through community networks, Spanish-language press, radio DJs and unions. Like Adorno today, Engler said he had trouble at times keeping up with the burst of self-organizing. “For a while, the people outpaced the mainstream labor unions,” he explained. Yet, more than charismatic leadership or sophisticated organizing, it was the individual decisions to resist that ignited the 2006 movement. According to Engler, it was the willingness of organizers to “sacrifice and disrupt” by calling for strikes and campus walk-outs that sets 2006 apart from other moments of political setback. “People were actually putting themselves on the line,” he said, “risking their jobs, their safety.” In these direct actions, the immigrant community forced the American public to grapple with the real implications of anti-immigrant rhetoric, causing many to reconsider. Engler points to Alabama’s anti-immigration legislation, HB 56, which caused a mass exodus of immigrants after it passed in 2011. “People realized that entire business sectors would collapse without immigrants,” he said, “and a lot of Republicans flipped their opinion on the bill. This proves that even racists can shift if you show them the economic impact.” It’s also evidence that strikes like the upcoming May 1 action can work. Yet, despite this caution, labor unions are taking a bolder stance than they did in 2006, when they limited their support to protecting individual members who joined the strike. “This time, there are unions actually endorsing the strike, which is huge,” Engler explained. Cabello says unions make a “natural partner” for the action, but many of them would not have joined without direct pressure from their members. In the case of one branch of the Service Employees International Union in California, members arrived at a meeting bearing signs announcing, “We’re ready to strike on May 1.” Others needed less convincing. “This is why [they] joined unions in the first place — they want to strike and make a difference,” Cabello said. So far, Cosecha’s partners include the Food Chain Workers Alliance, the SEIU United Service Workers West, and UNITE HERE Tech Cafeteria Workers, which together represent at least 400,000 members ready to join the May 1 strike. Also joining the strike are local business owners and members of the tech industry.